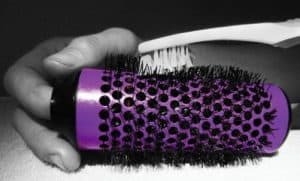 Why should you clean your Click n Curl brushes? A clean brush works better. 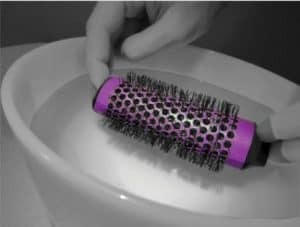 Hair can get clogged up in the brush bristles, blocking the vent holes and slowing the air flow and drying time. Eliminate product buildup. 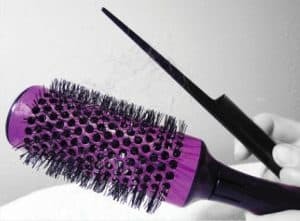 Product residue builds up on the bristles and gets redistributed into your clean hair when you re-use the brushes. Old product can make your hair dull and sticky! Cleaning your Click n Curl is easy and only takes a few minutes! Gently run a comb (a pick comb or pen works great!) 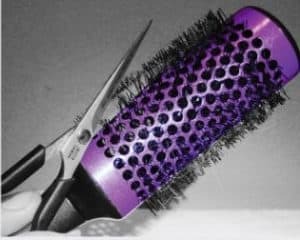 over the Click n Curl brush head to remove the hair. Be careful not to scratch the ceramic coating. *Tip: if there is a lot of hair and it is difficult to remove, take a scissors and snip down the center of the matte. In a bowl, mix the warm water, shampoo and baking soda. Dip a toothbrush into the mix and apply to the brush, scrubbing the barrel and bristles gently. Fill a bowl up with clean, warm water about ½ inch- 1 inch deep. Roll brushes in warm water until free from suds. Rinse thoroughly without totally immersing the brush. Place on a towel to air dry, lying horizontal. Voila! Your Click n Curl brushes are squeaky clean and shiny as the day they were born!